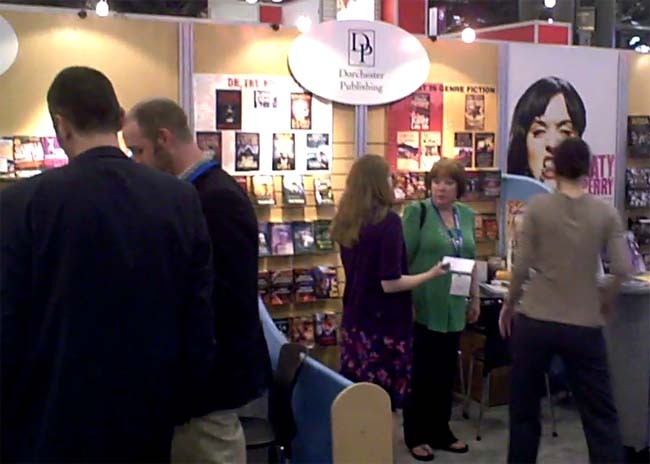 Having stiffed its writers, Dorchester Publishing is spotted with a BEA booth. They still aren’t talking and they still aren’t paying. Many publishing insiders I talked with were surprised that Dorchester had the guts to show up, but expressed a reluctance to confront them on the floor for their negligence — largely because the company, demonstrating its commitment to cowardice, was hiding behind young assistants who were hawking their products. It reminded me of the way very young and very inexperienced soldiers take bullets in the battlefield. Fortunately, on Thursday morning, I spotted an older woman. “Who’s in charge here?” I said. Hannah Wolfson, Marketing and Promotions Coordinator for Dorchester, identified herself and demonstrated the extremely limited nature of her vocabulary. Why hasn’t Dorchester paid its authors, some of whom have been waiting for years? Do you have any comment beyond “no comment”? Okay, how about this? Do you believe Dorchester to be a deadbeat? I was then told told that Dorchester is maintaining its commitment to paying its authors. I was given no specifics on how this commitment would be upheld. “You’re not going to get much beyond ‘no comment,'” said one of the young assistants. As of early Thursday afternoon (with only two more hours to go), Mr. Anthony has not been seen on the Jacob Javits floor. So it looks like Dorchester’s team are liars as well as deadbeats. When a CEO and his minions lack the guts to offer direct answers to vital questions, chances are that they aren’t part of a serious business.